With our consistent focus on globally hit trend, we proudly introduce a wide assortment ofSiemens Simoreg DC Master 6RA70 DC Drive. Appreciated for features like compact design, robust construction, easy installation, corrosion resistance and longer life, this d is highly demanded in the market. These DC drives are equipped with a PMU simple operator panel mounted in the converter door. The panel consists of a five-digit, seven-segment display, three LED’s as status indicators and three parameterization keys. 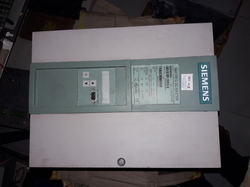 The Siemens Motor Regulator (SIMOREG) is a state of the art, microprocessor based DC drive controller. This drive controller converts a three-phase, 50/60 Hz supply voltage into six pulse adjustable voltage to operate a DC motor. Output armature voltage varies directly with speed reference to provide constant torque operation from zero speed to base speed. Above base speed, the motor shunt field current may be decreased to further increase speed and provide a constant horsepower output up to maximum speed. The SIMOREG DC drive controller is designed to provide precise motor speed control over a wide range of machine parameters and load conditions. This software based controller will serve well as a packaged drive or as part of a drive system. Horsepower ranges include 1-250HP at 230VAC, 2-1750HP at 460VAC input and 1500HP and higher at 600/650V AC input. All HP ratings are available as regenerative or non-regenerative drive controllers. Listed below are standard features, a partial list of adjustments, display parameters, service conditions, diagnostics, and protection features. Consult the Serv-e-Lektronics Section for additional information. Contact us! We have a good prices and excellent service! SIMOREG DC Drives, the first DC drives to fit within Siemens Totally Integrated Automation strategy, SIMOREG drives have been completely integrated into the Siemens system environment. Engineering/configuration and programming, as well as communications, share a common database – saving time and expense. The SIMOREG DC-Master family features an output range from 5 to 3,350 HP (3.7 to 2,508 kW).